Somewhere between the druid and the wizard lurks the witch. A figure of mystery and romance, of bittersweet endings and of revenge inspired beginnings. From the hedge wizard to the crone, the healer to the hag, the woman in the tower to the beastly nightmare that exults in the terror of his enemies; the witch is a constant source of imagination as either an ally or an enemy. The witch class, however, is far more than a simple stereotype. He is a figure who recognises the powers within nature, but also believes in the governing forces behind it. 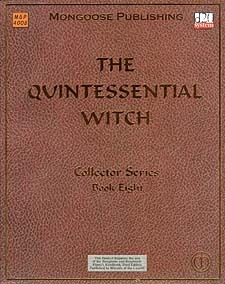 The witch is more than a simple revision of one or more of the existing classes. Rather, he stands as the symbol of uncluttered beliefs, an intricate connection between mortal ingenuity and infinite divine power. The witch, as he is discussed here, blends arcane and divine magic into a vastly reconceived character that can be seamlessly integrated into any campaign. For games masters and players alike. Requires the use of the Dungeons & Dragons Player's Handbook, Third Edition.